​Borussia Dortmund moved back to within one point of Bayern Munich at the summit of the Bundesliga with a comprehensive 4-0 win away to SC Freiburg. 12 minutes was all it took for Dortmund to take the lead, courtesy of Jadon Sancho’s 11th league goal of the season. The 19-year-old was well placed inside the area to convert Marco Reus’ low cross to finish a flowing move – giving the visitors a slender advantage at the interval. Mirroring the first-half, BVB scored early in the second period – nine minutes into it to be precise – as Reus latched onto Raphael Guerreiro’s through-ball to finish past Alexander Schwolow. The points were assured 11 minutes from time via another sweeping move for Dortmund that was finished off by Mario Gotze. Substitute Paco Alcacer then netted a late penalty, after Pascal Stenzel was adjudged to have handled inside the area, to round off a comprehensive win for Lucian Favre’s side at the Schwarzwald-Satdion. Starting XI: Schwolow (6); Stenzel (6), Schlotterbeck (5), Heintz (5), Gunter (6); Haberer (5), Hofler (6), Frantz (6), Grifo (6); Niederlechner (5), Waldschmidt (6). Substitutes: ​Daferner (), Gondorf (), Terrazzino (N/A). Borussia Dortmund knew that nothing less than a win would do against SC Freiburg in relation to the Bundesliga title race, and to their credit, produced an efficient display to earn three vital points. The early goal, which was a well-worked move, undoubtedly settled any first-half nerves. Barring an acrobatic save from Roman Burki to deny Gian-Luca Waldschmidt from distance, the opening 45 minutes passed without too much incident. 4-0 Paco and FT. Big win for Dortmund. made sure the points were secured for Die Schwarzgelben with late goals apiece. It’s a win that moves Lucien Favre’s side back to within one point of Bundesliga leaders Bayern Munich, and it’s all they can do beaten now and the end of the season. They must continue winning and hope Die Roten drop points if they’re to win their first league title since 2012, but BVB look as if they’ll be breathing down Bayern’s neck until the end of the campaign. Starting XI: Burki (6); Wolf (6), Weigl (7), Akanji (7), Diallo (7); Witsel (7), Delaney (7); Sancho (8), Reus (9*), Guerreiro (7); Gotze (7). Substitutes: Toprak (6), Pulisic (6), Alcacer (7). As he’s so often been over the course of the season, Marco Reus proved to be the difference-maker once again for Borussia Dortmund. It was he that injected the pace into the move that resulted in Sancho’s goal after 12 minutes, with the German laying it on a plate for the youngster – before turning from provider to scorer after the interval with a composed finish. His cross was finished off by Gotze 11 minutes from to time in what was a terrific afternoon’s work for Reus – resulting in one goal and two assists when his side desperately needed the win. #SCFBVB what a goal by #BVB! Fantastic combination play by the forward line, and a great pass by Marco Reus to Jadon Sancho, who scores his 12th goal of the season. Next for SC Freiburg is an away game against RB Leipzig in a weeks time. Borussia Dortmund meanwhile have the small matter of the Revierderby next weekend, as they host Schalke at the Signal Iduna Park where only a win will do to maintain their title charge. ​Bournemouth centre back Steve Cook has revealed how he thought his career was over when an infection in his groin left him feeling paralysed. The 28-year-old was forced to miss nine weeks of the season after succumbing to the problem in February, having initially played through the pain that he first suffered at the end of last year. Cook has now returned to the Bournemouth starting XI, however there was a time when the defender was not sure whether he would ever be able to play again. In an interview with SunSport, Cook said: “It was the worst I have ever felt, I cannot really describe the pain I was in and I would not wish it on anyone. “I felt paralysed through pain at one point. Cook has been a near ever-present for the club since joining on an initial loan deal in 2011, when Bournemouth were still in League One. His spell on the sidelines coincided with a run of just one win in seven games and, once he was fit enough to return, manager Eddie Howe put the Englishman straight back in the side in the 5-0 victory over Brighton last weekend. Howe praised the defender for his response to the debilitating injury, saying: “It was a really nasty infection. Speaking to him at the time and afterwards, it was a really low point for him. Cook’s return was not enough to help Bournemouth on Saturday afternoon however, with the club slipping to a 1-0 defeat against recently-relegated Fulham at the Vitality Stadium. Serie A has branded recent incidents of racial abuse in Italian football as ‘unacceptable’ and have vowed to do everything in their power to prevent any future episodes. Inter received a two-match stadium ban earlier in the season after monkey chants were directed towards Napoli defender Kalidou Koulibaly and the Nerazzurri have been charged with two more instances of racial abuse since. Juventus players Moise Kean and Blaise Matuidi were also subject to abuse from Cagliari supporters at the start of April, but no punishments have been handed out. A spokesperson for ​Serie A has commented on the matter, saying (via ​ESPN): “Lega Serie A strongly condemns the racist episodes and the spreading of discriminatory chanting and violent images on social media as has occurred in these past few days. Critics, such as the organisation ​​Kick It Out​, have suggested that Italian football doesn’t take the matter seriously enough and current punishments are far from suitable. The spokesperson for Serie A claimed that the league is doing its best to rectify this and assured that everything will be done to kick racism out of Italian football. Manchester United fell to a stunning 4-0 defeat to Everton in the Premier League as Everton ran riot at Goodison Park on Sunday. David de Gea was forced into a fine early save from a close-range Richarlison effort ten minutes into the first half as Everton started strongly, and the Brazilian capitalised with his next chance just two minutes later, firing an acrobatic effort into the roof of the net following a long throw-in. Manchester United looked to grow into the game with their first real attack of the game 25 minutes in, but Everton responded emphatically with a swift counter attack, rounded off by a sublime Gylfi Sigurdsson strike from 25 yards to double the Toffees’ lead with aplomb. 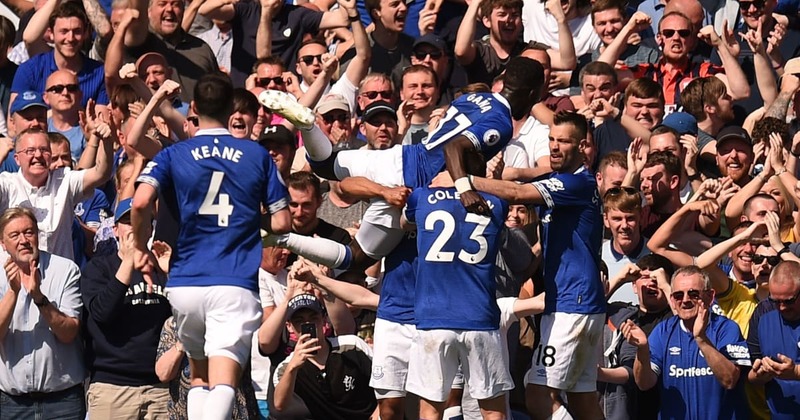 ​Everton picked up where they left off in the second half, and Lucas Digne hammered home the Toffees’ third ten minutes into the second half to raise the roof off Goodison Park. Theo Walcott compounded the misery for the visitors as he broke clear of the ​United backline to add the fourth just after the hour mark as the Toffees cruised to an emphatic victory. ​Goodison Park has proved to be a tough ground to visit once more this season and Everton have relished taking the game to the big teams on Merseyside of late with big wins over Chelsea and Arsenal. Sunday’s clash with United proved to be more of the same as the Toffees went full-throttle from the outset, carrying a real attacking threat to Ole Gunnar Solskjaer’s side with great power and intensity, and generally dominated the game in all departments. Everton seem to have caught their rhythm towards the end of this season. They are no pushovers. Good squad with a brilliant manager in Silva. Richarlison was typically at the forefront of the threat that Marco Silva’s side posed the visitors and ensured that David de Gea and co would not have a comfortable day’s work at Goodison. After a slow start to life at Everton, Silva finally seems to be getting the best out of his side. STAR MAN – Everton were excellent to a man on Sunday and it is difficult to only single ofut oe player, but Lucas Digne was quite brilliant at left back. The Frenchman helped to contain the visitors’ attacking threat with ease, whilst his industry and drive going forward epitomised everything that the Toffees did well at Goodison Park. Oh. My. Word. These Everton goals are getting better by the second!! Lucas Digne with one of the sweetest strikes you’ll see this weekend! What a stunner! That about wraps it up for United. Digne’s long throw-in to set up Richarlison’s opener was decisively direct, and his long-range hammer of a strike for Everton’s third encapsulated the emphatic nature of Everton’s performance, and indeed their superiority over United on the day. Much has been made of Manchester United’s decline in form and performance levels since Ole Gunnar Solskjaer’s permanent appointment as manager, and Sunday’s display at Goodison Park was another suggestion that all is not as well as it previously seemed under the Norwegian. The Red Devils were outmatched by Everton in terms of quality, attitude and purpose on Merseyside, with not one of United’s players in a star-studded side looking capable of taking control over proceedings, with Paul Pogba, Marcus Rashford and co largely peripheral. This is just rotten to the core. Everton have been absolutely fantastic for this first half hour, they deserve all the credit here, the season peaked in Paris over a month ago. Disgusting attitude from the players the last few weeks. STAR MAN – As tough as it is to identify just one Everton player as the standout performer on Sunday, it is equally testing to find positives in the displays of any of United’s players. Marcus Rashford was unable to have a telling impact on the game, but the striker was the one player who at least attempted to make something happen and looked as though he actually cared. ​Watford host Southampton at Vicarage Road in the Premier League on Tuesday with both clubs harnessing differing aspirations near the end of the season. Javi Garcia’s men are fighting to claim seventh in the league and in doing so secure European football for next season, while Ralph Hasenhuttl’s side are seeking a positive result to inch them further away from the relegation zone. Both clubs will be hoping for a victory at this stage of the season while ​Southampton lost their last outing and the Hornets edged Huddersfield to secure a much needed win. Here’s our breakdown of Tuesday’s ​clash. ​Watford will be without captain Troy Deeney as he serves the second of his three match suspension after he received a red card for elbowing Lucas Torreira against ​Arsenal. Hasenhuttl continues to be without Michael Obafemi while Mario Lemina returned from the bench in his side’s defeat on Saturday. Meanwhile, Yan Valery could return for Southampton after recovering from a knee injury. Southampton and Watford have come to blows 82 times in their respective histories, with the Saints coming out on top in 35 of those compared to Watford’s 26. The last time these sides met was in the reverse fixture back in November, where the now departed Manolo Gabbiadini opened the scoring for the hosts in the 20th minute, before Jose Holebas netted an 82nd minute equaliser to deny Mark Hughes’ side victory and prompt Charlie Austin to go on a memorable rant about the match officials. Austin’s rant referred to a disallowed goal that would have put Southampton 2-0 in front, with the referee incorrectly believing Austin’s shot had gone in off team-mate Maya Yoshida, who was in an offside position. Watford will be looking to record successive wins after they left west Yorkshire with all three points courtesy of Gerard Deulofeu’s brace handing them a 2-1 win. It was a positive reaction after a 1-0 loss to Arsenal which saw them put in a spirited display after going down to ten men and arguably were unlucky to leave the game empty handed, especially having hit the woodwork twice. The goal remains for Gracia’s men to achieve their best ever Premier League finish, with seventh place firmly in their sights as they bid for European football. Having previously won three of their last four matches, Southampton came unstuck away at ​Newcastle on Saturday, with Ayoze Perez’s hat-trick condemning them to a 3-1 defeat. With only five points separating themselves and Cardiff in 18th, the Saints will be desperate for a win in their bid to secure their ​Premier League status. ​With ​Cardiff playing on Sunday, the result of that match could have a big effect on the tactics and personnel Hasenhuttl opts to go for, with a draw very possibly seeming like a good result if the Bluebirds fail to beat Liverpool. If that is the case, then the cautious approach could play into Watford’s hands, while if the visitors head to Hertfordshire looking to win it could change the dynamic of the game massively.